This entry was posted on April 20, 2010 at 12:00 pm	and is filed under Electronics. 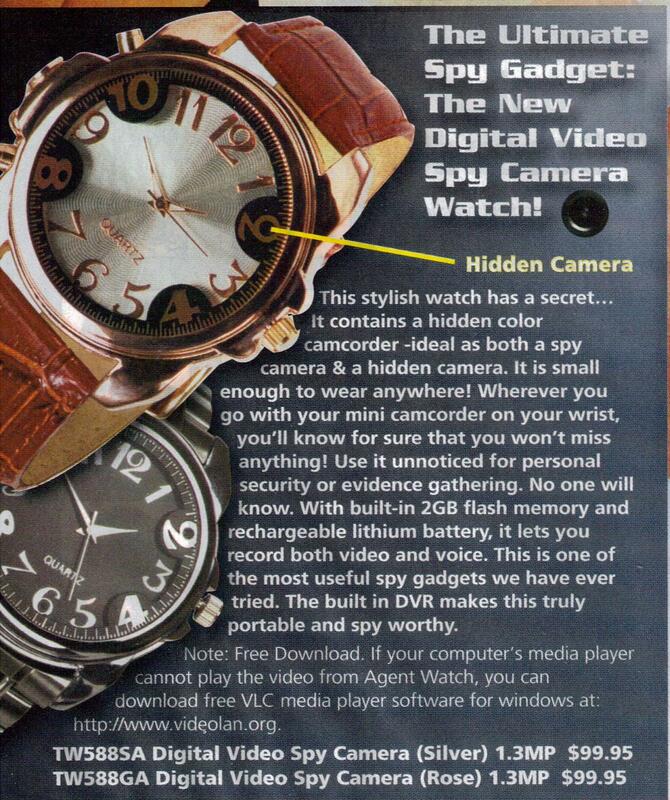 Tagged: camera, catalog, illegal-activities, skymall, spy-gagets, watch. You can follow any responses to this entry through the RSS 2.0 feed. You can leave a response, or trackback from your own site. I agree with you that the people selling this camera are being somewhat irresponsible in how they’re pushing it, but I also think there are probably legal, “evidence” gathering uses for it in public. It’s one thing to record someone in a private home without their consent, but if you are on a crowded street, I’m pretty sure recordings and pictures are fair game. I’m sure it’s possible to invade someone’s privacy in a public place, but I’m under the impression that the bar is a lot higher for you to prove that you had that “reasonable expectation.” I don’t think the recorders/photographers have an obligation to make it obvious to all their subjects that they’re doing so (at least not legally). If they did, normal things like people taking newspaper photos at football games would be legal disasters. It’s very complicated in public places. Things like taking newspaper photos are ok because it’s very obvious they’re doing it. Things like taking cell phone pictures aren’t always ok. It has to do with “expectation of privacy”, which is dicier in public, obviously. Regardless, “gathering evidence” is generally understood to involve gathering things that people want to keep private – personal conversations, things kept in a purse, etc.